Let's face it - web design and web development are industries that are changing as we speak. These trends dictated that every single website should be mobile-friendly as well as responsive. Just think about the smartphones and the fast pace of the Internet over the past few years. Nowadays, there are more mobile devices than people on the planet. Browsing the Web is nowadays more exciting and convenient than it is on a computer. So, having a mobile-friendly and responsive website is the ticket to success. Not only Google likes and promotes mobile-friendly websites among the top search results. Also, customers engage with mobile websites and interact with them in a better way. Without a doubt, a mobile website that fits any device is as important aspect as having a website in general. The Mobirise html website builder proves that once again. It is a perfect example of a software that helps you 'build' a mobile-friendly website in an easy way. That's why Mobirise is included into the 20 Best Free Website Builder tools sorted by popularity. In other words, Mobirise is the software you need to build an online website and fit it to any device. Once you download the app, the work can start. The application is easy to use and works in a simple way. 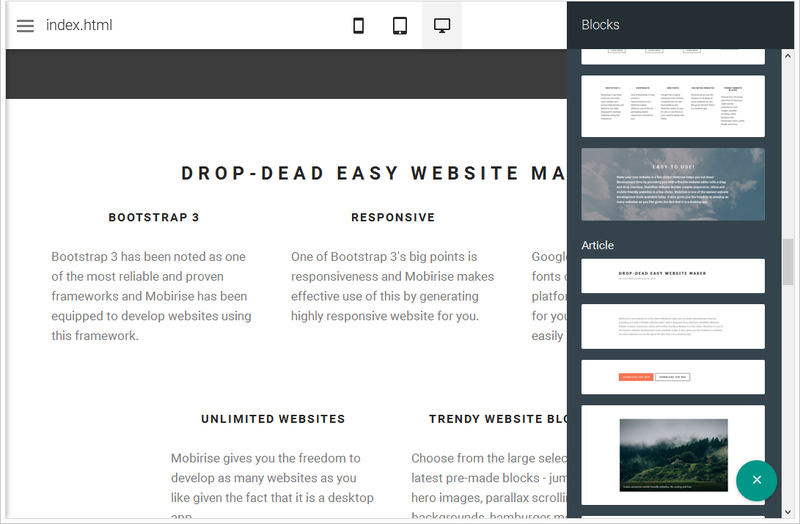 You can resize and rearrange and move blocks - hence, customize your website in an easy way. With Mobirise, you can also upload pictures directly to the website builder and re-size the graphics as you see them fit. The control panel features a few main buttons and icons. They work seamlessly when making a website. When you finish customizing your website, Mobirise lets you publish it by hitting the 'Publish' button. Or, you can save the website as a file in your disk drive and upload it on a FTP server or even save it on Google Drive. Amazing, isn't it? The best part about Mobirise is that it is extremely easy to master it. You can build website blocks, use various techniques to customize texts, images and blocks. This lets you engage in a bold and minimalistic experience that is different from any generic website builder. In a nutshell, Mobirise is the best shortcut in designing a professional website for any purpose. Are you tired, unwilling or don't know how to create a website in the quickest way possible? Mobirise is definitely for you. The app lets you build websites on-the-go. It also ensures that each website fits every screen, is functional and engaging. The Mobirise website builder leverages the bootstrapping technique when creating each website. In short, bootstrapping a website means building it with only a few initial instructions and guaranteeing a result that is the same, if not better, than any other method. Any online user can learn to create websites with Mobirise. In fact, Mobirise HTML Website Builder Software is among the most practical and easy website makers on the market right now . The results is always an amazing website that fits to any screen and look good across all devices. 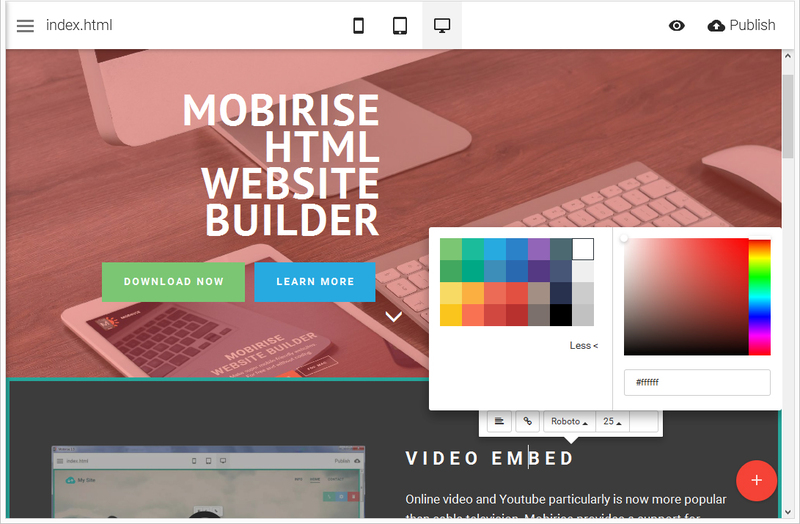 Now everyone can master creating websites using Mobirise Website Builder. You just drop the blocks that seem fit into your page and edit the on-page content as you see it and click the Publish button. Mobirise lets you design stellar websites for various purposes without any technical skills needed. In the end, Mobirise HTML Website Template Builder is the most unique free website builder that lets anyone build amazing and eye-catching websites. Instead of hiring a developer, you can now engage and build websites in no time. Plus, it is a mobile-friendly solution that saves you money with each website you create. So, why not build your first mobile-friendly and responsive website with Mobirise? We guarantee you'll love it! Download Website Builder Software Now!